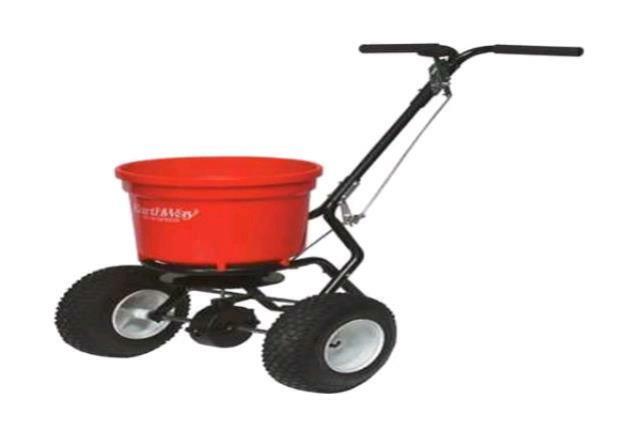 The circular spreader has a weight of 15 lbs, with a 16" overall width, 28" height at handle, 44" overall length and 8" wheels. It has a 40lb capacity, and is used for spreading fertilizer or seed. The spreader does not work well for lime, as it does not feed well down into spreader. * Please call us for any questions on our circular spreader in Concord, serving all of New Hampshire, including Manchester, Canterbury, Loudon, Hillsboro, and Northwood.